EarthCoating® is a highly-mineralized resin alternative to 100% plastic coatings for paper-based barrier packaging applications. Ideal for all types of paperboard barrier packaging applications including paper cups, food trays, folding cartons, take out boxes, labels, liners, corrugated packaging, flexible bags and more, EarthCoating® delivers premium aesthetics, functionality and barrier performance compared to traditional plastic coatings. Paperboards with EarthCoating® may be easily processed into recycled paper using conventional paper recycling equipment and use 51% less plastic than conventional plastic-coated paperboard barrier materials. Available in clear and white formulations using various mineralized resin blends, EarthCoating® may be customized to meet your specific aesthetic, functional, barrier and ecological needs. To learn more, download our EarthCoating One Sheet and give us a call today to discuss your next project. Traditionally, mixed grade paper barrier packaging applications such as paper cups, take out boxes, folding cartons, etc. are coated with 100% polyethylene and other similar materials, which make the resulting products poor candidates for repulping because of the difficulty recyclers have processing the plastic-coated materials. 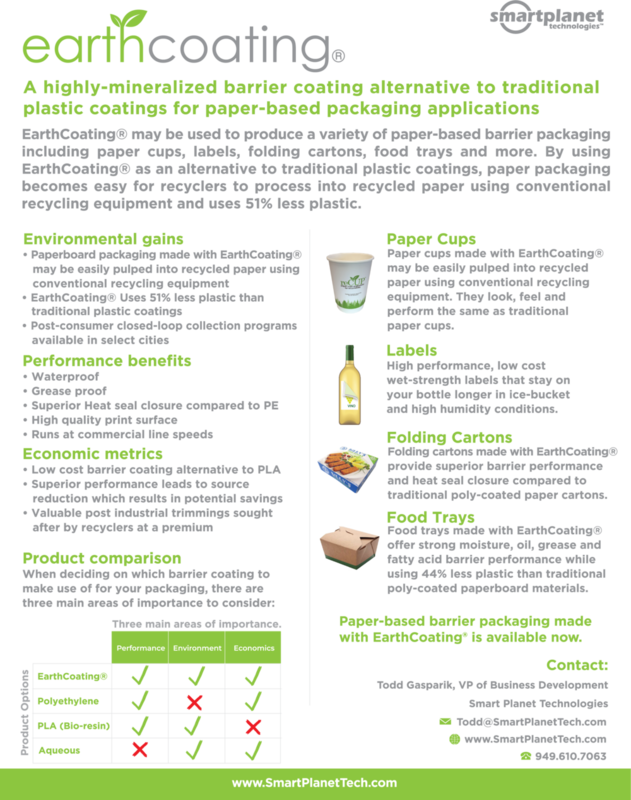 By contrast, mixed grade paper barrier packaging applications made with EarthCoating® provide a great potential for post-consumer repulpability because they can be easily processed through the paper recycling stream using conventional paper recycling equipment. Paperboards with EarthCoating® offer a repulpable alternative for any polyethylene-coated paper packaging material. Unlike traditional plastic coatings which break into large, light flakes that clog the screens during the recycling process, EarthCoating® fragments into small dense particles that are easily removed as part of the recycling process. The mineral content in EarthCoating® displaces up to 51% of the plastic by weight that would otherwise be found in a traditional plastic (polyolefin) coating. Energy savings are realized whenever paperboards are recycled. Paper tonnage which might otherwise be buried in US landfills may be collected and reused, resulting in reduced greenhouse gas emissions and energy savings. For example, every ton of paper recycled can save the energy equivalent of 165 Gallons of gasoline. If the approximately 58 billion paper cups that are buried in US landfills each year were to be recycled, approximately 700,000 tons of paper would be recovered – resulting in energy savings equivalent to removing almost a quarter million cars from our roads. When switching from traditional plastic coating to EarthCoating®, an immediate 40-51% plastic reduction becomes realized and additional source reduction may be achieved due to potential lower coat weights, leveraging the superior barrier performance of a mineralized resin coating. The minerals in EarthCoating® produce a tortuous path for moisture to pass through, resulting in better moisture vapor transmission rates (MVTR). Ask about our MVTR report. Mineralized resins absorb and dispel heat differently than neat polyolefins, resulting in better heat seal performance and fiber tear. Unlike traditional polyethylene, EarthCoating® offers a high surface energy complete with a typical post-corona dyne level of 46, providing an excellent print surface for high quality graphics using digital, offset, flexo and rotogravure printing techniques. The high surface energy of EarthCoating® provides enhanced adhesion capabilities. Unlike traditional plastic-coated packaging materials, paper cups and other paper-based barrier packaging produced with EarthCoating® are valuable to collect and easy to pulp into recycled paper using conventional recycling equipment. As a result, closed-loop collection programs have been set up in select cities around the world to collect post-consumer EarthCoating® materials and the economics are favorable. To learn more about the work we're doing in this area, visit our News section where you can read about our latest projects. For those interested in setting up a closed-loop collection program, contact us. Paper-based packaging applications coated with EarthCoating® are engineered for repulping through existing paper recycling streams, providing premium high value fibers without plastic contamination nor a laborious depolymerization process found in the effort to process traditional paperboards with 100% polyolefin coatings. As a result, industrial EarthCoating® trimmings are sought after at a premium value by recyclers, resulting in a potential rebate for supply chain vendors. The use of low cost minerals in the resin blend, offsetting traditional 100% plastic resins, may be used to create material cost savings compared to neat polyolefin or bio-resin coatings. Compared to traditional plastic coatings, EarthCoating® provides superior barrier performance, which often results in an opportunity to down gauge coat weights, leading to source reduction and potential cost savings. Calcium Carbonate is blended into polyolefin resin, creating a compound called EarthCoating®, which may be extrusion coated onto various papers and paperboards at high commercial line speeds using conventional extrusion coating equipment without any additional capital investment. EC-40: 40% Calcium Carbonate / 60% LDPE - ideal for coffee cups, folding cartons, food trays, etc. EC-51: 51% Calcium Carbonate / 49% LDPE - ideal for coffee cups, folding cartons, food trays, etc. EC-COEX-EU: 43% Calcium Carbonate / 57% LDPE - ideal for coffee cups, folding cartons, food trays, etc. to be used throughout Europe. EC-WHITE: Various blends of pigmented EarthCoating® are available upon request. To learn more about this option, contact us.